Today is the International Chocolate Day (though it is also celebrated on July 7th) and we share an infographic for A1 level students to celebrate it. Download it and do the activity based on the game "Who wants to be a millionaire?". Any questions? 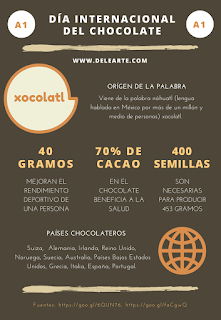 Write to contactos@delearte.com and we'll be more than happy to contact you back.